The Surficial Geology of Southern Ontario 2010 - Polygon Representation feature captures surficial geology unit polygons, which classify the earth's surface by the surface or nearsurface geological material. The map has recently been revised and updated and replaces the map previously released on MRD 128. This new version now includes surficial geology information for the Bruce Peninsula and as well as NTS sheet 31D\9 covering the Burleigh Falls area. It illustrates surficial deposit types, material types, geological features (e.g. drumlins, eskers) and general bedrock types and outcrops. 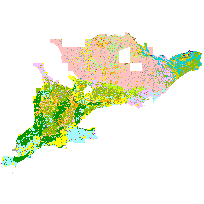 The Surficial Geology of Southern Ontario 2010 data set is a GIS based geological map that shows the distribution and characteristics of surficial units across Southern Ontario. It illustrates surficial deposit types, material types, geological features (e.g. drumlins, eskers) and general bedrock types and outcrops. The surficial geology of southern Ontario consists largely of varying types and thicknesses of deposits emplaced primarily during the Quaternary period. These surficial deposits overly a bedrock terrain consisting mainly of Phanerozoic sedimentary rocks that overlie older Precambrian rocks of the Canadian Shield. To provide a detailed overview of the surficial geology of southern Ontario and associated attributes available to the land-use planning, consulting, aggregate/industrial mineral industry and development community as well as government geoscientists, resource scientists, conservation authorities, land-use planners and academic researchers. Also, the data set will be of value to the broader scientific community, school teachers and general public who have an interest in Ontario's geological history and use of earth resources. The purpose of the Miscellaneous Release--Data is to provide data sets and data products to determine attributes available for mineral exploration, land-use planning, consulting, mineral resource studies and baseline environmental studies. The information can be used for orienting, planning various types ground survey operations, drift exploration, resource development studies and to assist government geoscientists, conservation authorities and academic researchers. The objective of this product is to collect and disseminate geoscience information for Ontario. The map has recently been revised and updated and replaces the map previously released on MRD 128. This new version now includes surficial geology information for the Bruce Peninsula and as well as NTS sheet 31D\9 covering the Burleigh Falls area. A total of 125 maps, 36 of which belong to the GSC, were used to create the seamless coverage. These original, tiled maps existed as either digital vector or raster format. The raster images were rubber sheeted to a geographic base and digitized (head's up) according to standards established for the project. Polygonal, point and line information was captured as part of the automation process. Coverages created include; sgu_poly, sgu_point, sgu_line, sgu_mor, sgu_misc, ogs_pits and sgu_anno. Attribute tables were built and populated with various geological related information. The original maps contained legends of varying detail and terminology, therefore, a single, standard legend suitable for a 1:50 000 compilation was constructed. This legend, created using Microsoft (RegTM)Access Database software, was used to translate all original map units to the new standard legend. Each of the map attribute tables was joined to the translation table using a unique key. A series of additional attributes, for instance, primary material and genesis were extracted from each map sheet and included in this table. By capturing these attributes a variety of derivative maps can be produced. For instance, for aggregate resource assessment studies a map of gravel resources can be derived from the primary material attribute.Additional information and metadata are found within a readme file provided with the product. Measure Description: Horizontal: Approximate: +/- 250 m; Vertical: Not Applicable. Ontario Geological Survey, Ministry of Northern Development and Mines: OGS Hard copy Quaternary maps (Preliminary, 2000, ARIP and OFR map series): Used to produce the Seamless Quaternary coverage's for Southern Ontario. Quaternary field mapping done over this time range. Data collected from 01/01/1950 to 06/10/2003. OGS Hard copy Quaternary geology maps on file with the Mines Library, Sudbury Ontario, Canada. Complete map listing can be found within the Project Summary and Technical Document. Geological Survey of Canada (GSC): Geological Survey of Canada (GSC) Digital and Hardcopy Surficial Geology maps: Used to produce the Seamless Quaternary coverage's for Southern Ontario. Data collected from 01/01/1950 to 06/10/2003. Complete map listing can be found within the Project Summary and Technical Document. Ontario Ministry of Natural Resources: Base information for The Surficial Geology of Ontario: Digital data sets used as base information for The Seamless Quaternary Geology. Base information used includes weeded or generalized lakes and roads coverage's as well as a Digital elevation model (DEM) used to create a raster (JPG) shaded relief image for Southern Ontario. Data collected on 06/10/2003. NRVIS Roads and Lake coverage were supplied by The Ministry of Natural Resources, Ontario, Ontario Geo Spatial Data Exchange. These vector coverage's were weeded and stripped of all attributes for release in digital format. The Digital elevation model (DEM) used to create the shaded relief was created and supplied by the Geomatics Service Center, Peterborough.